This is a book about spectral methods for partial differential equations: when to use them, how to implement them, and what can be learned from their of spectral methods has evolved rigorous theory. The computational side vigorously since the early 1970s, especially in computationally intensive of the more spectacular applications are applications in fluid dynamics. Some of the power of these discussed here, first in general terms as examples of the methods have been methods and later in great detail after the specifics covered. 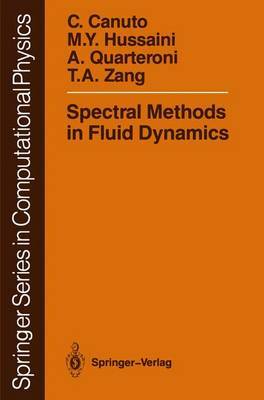 This book pays special attention to those algorithmic details which are essential to successful implementation of spectral methods. The focus is on algorithms for fluid dynamical problems in transition, turbulence, and aero- dynamics. This book does not address specific applications in meteorology, partly because of the lack of experience of the authors in this field and partly because of the coverage provided by Haltiner and Williams (1980). The success of spectral methods in practical computations has led to an increasing interest in their theoretical aspects, especially since the mid-1970s. Although the theory does not yet cover the complete spectrum of applications, the analytical techniques which have been developed in recent years have facilitated the examination of an increasing number of problems of practical interest. In this book we present a unified theory of the mathematical analysis of spectral methods and apply it to many of the algorithms in current use.